The U.S. Food and Drug Administration has found the herbicide glyphosate in more than 40 percent of samples in its first-ever test of the chemical. On October 1, the FDA released results from its Fiscal Year 2016 Pesticide Residue Monitoring Program analyzed between October 1, 2015 to September 30, 2016. The program analyzes levels of pesticide residues found in the U.S. food supply. Included in the program’s results is a new assignment conducted to specifically test two pesticides, glyphosate and glufosinate. Glyphosate and glufosinate are known as “broad spectrum herbicides” used for killing weeds as well as other agricultural uses. Glyphosate is also the key ingredient in Roundup, a pesticide made by the agribusiness company Monsanto. Now owned by Bayer, Monsanto was ordered in August to pay nearly $290 million in a civil lawsuit to a man who alleged his cancer was caused by his use of Roundup. Bayer has since sought to turnover the verdict as thousands more similar cases have been filed. In the FDA analysis of pesticide residue in food samples, all results show levels are of no concern to public health, according to the report. “Most FDA pesticide-testing protocols use multi-residue methods (MRMs). Due to the chemical nature of glyphosate, (previous) FDA’s methods did not work,” the FDA stated in the report. Source: Chart from FDA report. According to a recent Constituent Update from the FDA, the report concludes overall levels of residues fall below the U.S. Environmental Protection Agency’s (EPA) set tolerances. The FDA conducted the new assessment using the Selective Residue Method. This method is the FDA’s procedure designed to analyze either selected pesticide chemicals or a single pesticide chemical in a sample. 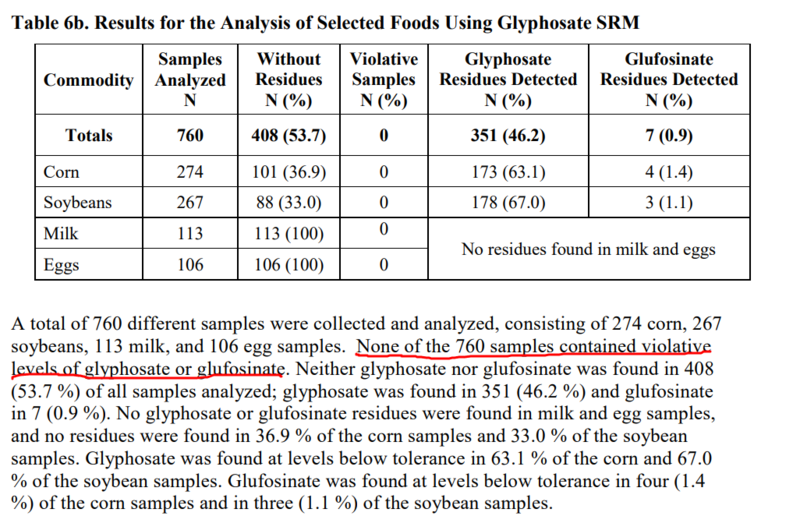 To test for glyphosate and glufosinate, samples were taken from corn, soybeans, milk and eggs. A total of 760 samples were tested for the two pesticides. In the milk and eggs samples, results presented no levels of glyphosate or glufosinate residues. In the corn and soybean samples, about 47 percent of the samples presented detectable levels of residues but fell below EPA tolerance levels. The EPA’s established tolerance for safe use of the herbicide glyphosate is 0.1 to 310 parts per million. According to the FDA, glyphosate blocks an enzyme that is vital to a plant growth. Similarly, glufosinate is a herbicide commonly used as an alternative to glyphosate. When applied, this pesticide only effects the part of the plant in contact with the substance. Routine procedures tested for additional pesticides. After examining 7,413 samples taken from 711 pesticides and chemicals, results show pesticide levels are well below the established safety standards, in agreement with last year’s report. Pesticides are known to combat pests affecting agricultural crops. Occasionally, these substances remain in or on foods. “The FDA takes very seriously the responsibility it shares with the EPA and U.S. Department of Agriculture (USDA) to keep foods free of unsafe levels of pesticide chemical residues,” states the Constituent Update. The FDA plans to include results for glyphosate testing in future reports.